30 km away from Aurangabad in a small village of Verul, are the impressive Ellora caves. Intricately carved into the sides of a basaltic hill of the Sahyadri Mountain this world heritage site is one of the best examples of rock - cut caves in the whole world. It is the meeting point of three faiths, Buddhist, Jain and Hindu. There are 34 caves in all. 12 Buddhist (600 -800 A.D.), 17 Hindu (900A.D.) and 5 Jain caves (800 1000 A.D.). The Buddhist caves from number 1 to 12, out of which ten belong to the Mahayana sect and two to the Hinayana sect of Buddhism. They all are viharas, Monasteries .Cave number 10 contains gigantic Buddha figure in meditation, seated on a lion throne, flanked by attendants and flying figures. Some caves have the story of the miracle of Sravasti when Buddha assumed thousand forms. The sculpture in the Buddhist caves accurately convey the nobility, grace and serenity inherent in the Buddha. The Hindu caves starting from cave number 13 are mostly dedicated to Lord Shiva. These caves have intricate carvings with minute details of the ornaments and clothes on the idols. But cave number 16 takes the cake. 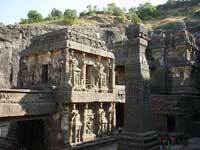 The most famous of all the Ellora caves is the Kailash cave. It is dedicated to lord Shiva and has many stories depicting the life of Shiva and therefore it has assumed the name of Kailash, the abode of Shiva. A figure of goddess Lakshmi seated on a lotus flower in water is shown at the entrance. Before that figures of Ganesh and Durga can be seen. The cave has huge Shivalingam on the first floor. This lavishly carved cave has been cut from one rock and is world's largest monolithic cave. Moreover this stupendous edifice, was begun from the top of the rock and worked slowly down to the floor, creating gateway, courtyard, pavilion vestibule and tower along the way with beautiful figures. There are figures of Dashavataras of Vishnu, and panels of stories from the great epics of Ramayana and Mahabharata. An important figure of Lanka King Ravana, trying to shake the Kailash, is seen along with various mythological stories related to the life of Shiva, including his wedding with Parvati and Ardha-nari-nateshwar, when Lord Shiva assumed the form of half man and half woman. Ellora, chiefly patronized by the Chalukya - Rashtrakuta rulers (7th - 10th century AD) are the testimony to the skills and imagination who built them. It took nearly 150 years to complete the Kailash cave with nearly 7000 labourers working round the clock. The Jain caves can be seen as the amalgamation of Buddhist and the Hindu caves. There are some intricate carvings and painted frescoes in these caves. The famous magnificent Yakshi statue and ceiling paintings are in cave number 32. Ghrishneshwar temple: Within five minutes driving distance from the Ellora caves is the ancient temple of Ghrishneshwar. A superb example of medieval temple architecture, it is dedicated to Lord Shiva and is considered to be one of the most important 12 Shivalingam temples, the Jyotirlingas, of India. It has intricate carvings on the exterior and was renovated by Rani Ahillyabai Holkar, of Indore in the 17th century.